I wanted to make K's dad a nice wool scarf last Christmas because his job involves plowing snow-piled roads during the winter. K was very particular about the pattern because his dad will never wear anything with the slightest bit of design. 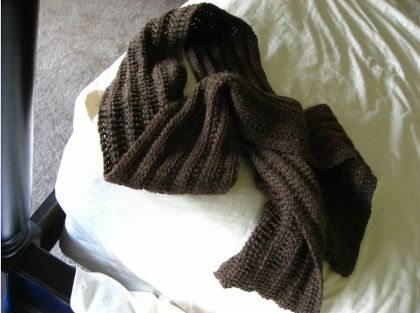 I bought the plainest brown yarn in the store and somehow convinced him that a ribbed scarf would still be ordinary enough not to provoke teasing from my father-in-law's coworkers. After attempting to knit a few inches, I could tell that I had another painfully slow project on hand (see previous post). Instead, I turned my eyes to Tunisian crochet, which has some lovely knit- and purl-like alternatives. While the stitches unfortunately don't look the same on both sides, I still think K's dad will like it. If nothing else, it'll keep him nice and toasty. To download this ridiculously simple (and free) pattern, click this link from Ravelry. Enjoy! It looks wonderful. :) Tunisian crocheting seems easy enough to do, but how did you start the first row? I'm not sure how to start it, doing both the knit and purl stitches where there are no vertical bars.